's first episode “Genesis,” it’s referred to as a 1970 model in a line where only fourteen were made-- the bottom line is for its time, it was hands-down the coolest vehicular male-bonding set on network TV. While typically in television and film, all driving scenes are faked as vehicles are towed along by expert drivers and rigged cameramen, the frequent usage of the Barracuda and the attention to detail of filming directly on the streets of San Francisco, employing hundreds of local workers in the roughly two million dollar per episode budget, set Nash Bridges apart from other police shows of the late '90s. Admittedly, the writers did note that in the first season, they were still finding their footing as the tone of the show changed from one episode to the next as some were filled with comical misadventures and others underworld dramas. And it's definitely evident in the eight-episode run to viewers watching the DVD as it’s obvious that the air-dates were mixed around as some storylines seem out of sync from how they may have originally been intended to appear. Still, despite this, it's a far better show than I would’ve assumed. Much lighter than the dark, seedy, and painfully hip '80s Michael Mann smash hit Miami Vice that launched Don Johnson-- series creator Carlton Cuse shared on the DVD that he wanted to present a more accurate portrait of the Johnson that he knew, which he called the fun version of the man with “real charisma” and a “great sense of humor.” So in the end, it’s this approach along with the series' emphasis on Johnson’s character Nash Bridges’ own domestic struggles that helped enable all involved to realize that that’s truly the type of show they wanted to make. Likewise, as Johnson noted in a DVD interview, the show’s conception was born out of issues that baby boomers were facing and with which they could therefore relate. A far cry from the much darker mafia and drug trade setting of the original script Johnson and good friend Hunter S. Thompson had originally pitched, Nash Bridges finds him instead playing the titular lead-- a top-notch inspector for the San Francisco Police Department who manages to use his photographic (or “pornographic” as he frequently jokes) memory and experience with magic in his work. 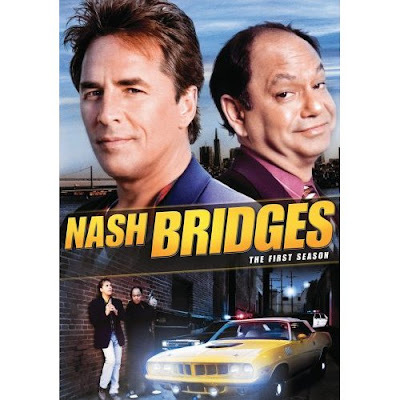 While the writers were always told that Nash Bridges was not an ensemble show and that instead it was a Don Johnson series all the way (and the actor who also produced had tremendous input on all aspects), each screenwriter took turns doing a “Nash pass” to ensure that they wrote the best possible script for their star, and their talent and training paid off as some have gone onto work on NCIS and another writer eventually created FX’s highly acclaimed The Shield. Yet, even though it was a Don Johnson vehicle, every supporting character gets a chance at the wheel and it wouldn’t have worked nearly as well without his amazing costar and buddy-in-banter, Cheech Marin. Although they’d known each other for two decades, as Johnson revealed on the DVD, it wasn’t until Ron Shelton’s Tin Cup that they’d actually worked together and as Marin joked, one day they filmed their first scene for Cup together and the next, Johnson asked him if he’d like to star alongside him in Bridges. While there was some legal wrangling to be sorted out as Marin was contracted on another show, eventually he joined the series for good as his former retired partner and long-time best friend, Joe Dominguez, who has since become a P.I. and later an accidental gay bar owner in a surprisingly funny business scheme near the end of season one. Married to the "Nordic Goddess" Inger, Joe seems to take everything in stride balancing work and family but Bridges is unable to turn off the cop part of his brain. Still dealing with mixed feelings, nostalgic spontaneous couplings and associations with two very different ex-wives and trying to raise an independent minded teenage daughter who’s growing up way too fast, Bridges is-- as the writers note-- a man who’s done everything right in his professional life and completely flunked his personal one. Whether he’s trying to juggle taking care of his elderly dementia-ridden father, deal with taking his first vacation in over four thousand days with his ex-wife (as an ironic newly-divorced honeymoon for the two who sizzle better without rings), or hitting up his many underworld contacts for leads, Bridges was multi-tasking before the term was added to the dictionary. Although sometimes it’s way too hard to believe that his character would still be able to go undercover since that distinctive car as well as his sterling reputation and ability to make headlines make him nearly as popular as (well) Don Johnson himself and his tendency to call everyone “Bubba” does feel more Smokey and the Bandit country slang than hip SFPD, but the first season of Bridges showed the series’ awesome promise to come. Action packed with some jaw-dropping chase sequences including one in the first episode involving guest star Lucy Liu and filled with enough shoot-outs and stand-offs to make John Woo green with envy, I was surprised to discover that something I feared would be at best a “B movie” version of a cop show was endlessly entertaining. Featuring audio commentaries, special interviews, the season one promo and more and arriving in a two-Disc DVD set on October 14 from Paramount Home Entertainment, don’t be alarmed if you find yourselves speeding through the eight episodes fairly quickly. Just don’t go too fast, for-- if you find yourself pulled over by Marin’s Dominguez in one of the season’s funniest scenes-- you may have to fill out your own speeding ticket yourself.